One of my recent favorite foodblogs to read has been Cupcakes Take the Cake. They have a seemingly endless supply of delicious and beautiful looking cupcake images and cupcake bon mots. When I read that Martha Stewart was having the writers on as guests as part of her cupcake week I had to watch. I rarely watch daytime television but she completely hooked me this week! 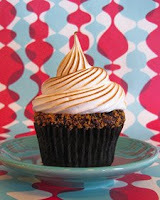 My absolute favorite cupcake recipe had to be Thursday's Chocolate Graham Cracker Cupcakes with Toasted Marshmallow from Jennifer Shea, owner of Trophy Cupcakes in Seattle. The cupcake has a graham cracker crust on the bottom, topped with bittersweet chocolate, covered with chocolate cake, graham cracker and chocolate crumbs make a crust on the cake then it is finished with a toasted French meringue. *drool* You can watch Jennifer and Martha make the cupcakes if you go to the recipe link. I think I'm going to have to do some baking tomorrow!